Europe is a continent where history is very close. It is a dream destination to millions. Tourists from all around the world flock to gaze at different masterpiece architecture, to take in the awesomeness of European street life and to admire the great variety of scenery and climate, the mountainous regions, thick forests and lakes. You just have to ask any travellers and from their observations and opinions, you can quickly round up a list of the most famous and beautiful places that they would recommend – places known for their recreation and leisure opportunities, the good restaurants, fascinating shops and museums, nightlife and architecture. Here are some of the must see destinations in Europe. This awesome Italian city nestling in the Tuscan hills has been the inspiration of many artists. There is no much to see in Florence that you may be tempted to cancel the rest of your European trip and stay put. The Santo Spirito Square for starters offers a host of different events to enjoy – fairs, food festivals and exciting workshops. September is great with mild temperatures and traditionally the period of harvest and making of wine. There are heaps of events around the harvest of grapes and wine making. If you didn’t know, France and Italy together make 40 per cent of world’s wine. If you’re looking for postcard beauty, this city, host to the Winter Olympics several times already, is extremely picturesque. This alpine city has a myriad of city- and nature- inspired activities waiting for visitors. From bobsleigh riding to alpine skiing to curling up in front of an open fireplace in an Alpine lodge, this vibrant city offers marvelous unbeatable restaurants, Christmas markets, hotels and nature. You’ll want to have photographs of yourself and the gorgeous mountain scenery as a recall of your sightseeing and cheap posters of quality paper, of any size and in different formats is THE way to remember all the tiniest details of such splendid times. No trip to Europe would be complete without visiting London. Welcoming more than a record-beating 18.82 million visitors just in 2015 alone, this city has won awards as the most popular city on the planet time after time. With its awesome blend of the most wonderful assortment of restaurants, its culture and history, this city just simply continues to dazzle, excite and enthral visitors who stream to it from every corner of the globe. Europe is a magical place to visit with a limitless number of fabulous and famous places to explore. The range of destinations and events can be overwhelming if you’re planning a getaway, from the Golden Circle, Reykjavik, Iceland to the Azores, Portugal to Germany and Spain. Unfortunately you will be forced to narrow down your choices. Remember to take lots of beautiful photographs which you can here have enlarged to gaze upon and recall how Europe measured up to every one of your ideals. VIENNA, AUSTRIA: Billy Joel sang this song “Vienna” in 1977 and the song brought back some awesome memories of our trip to Vienna while I was listening to it in YouTube. I had to dedicate this post on Vienna to that song and to Billy Joel. Vienna is the capital and the largest city in Austria. Surprisingly, history of this town goes back to 25,000 years but the written history is from the Roman period about 2000 years ago. 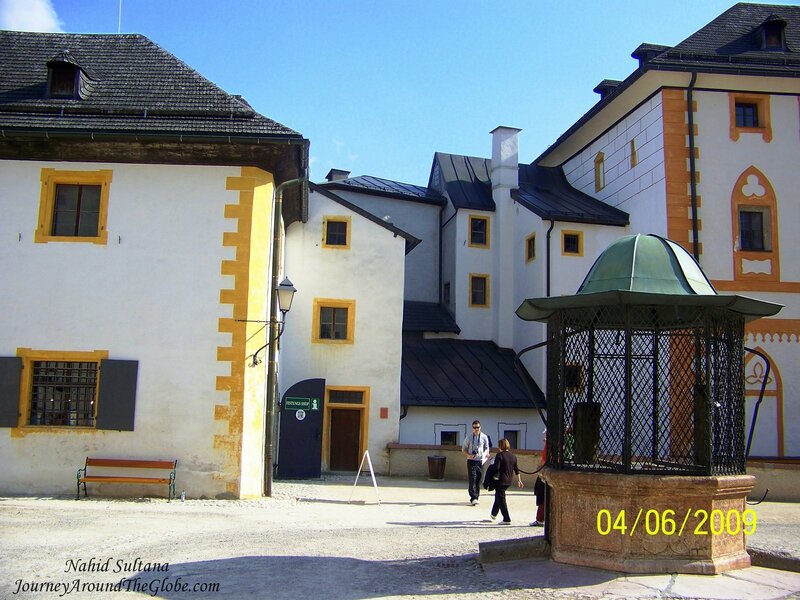 This was the home of the Habsburg family along with various empires from the past. For being the capital city of monarchy, you will see lots of rich cultural and historical buildings here. After WWII the city was left with much ruins. But thanks to Austrian authority, the city looks marvelous now with some touches from the past blending well with the look of present. 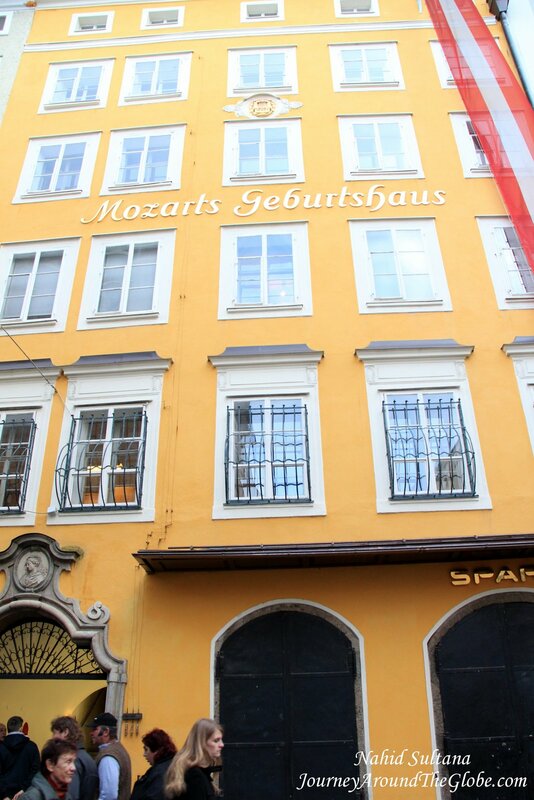 Austria is the country of Mozart and classical music. 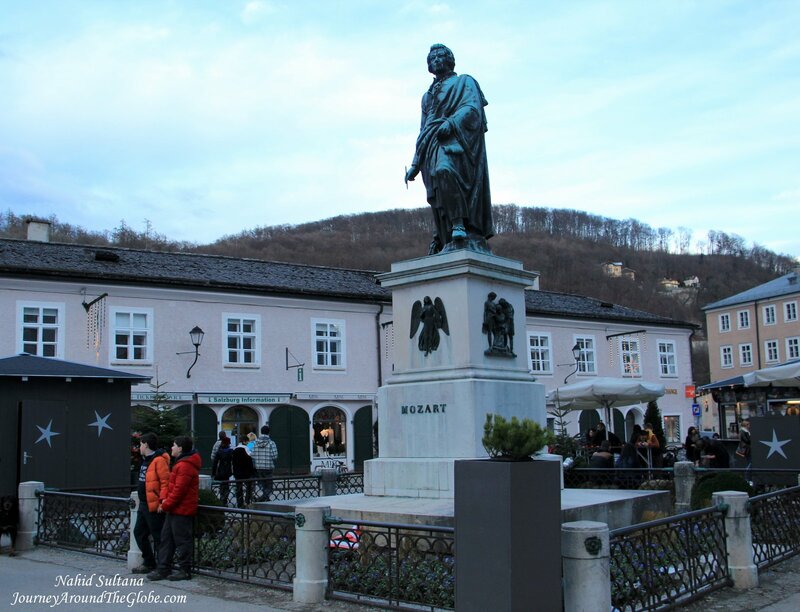 And just like Salzburg, you will see Mozart’s picture everywhere including in candy wrappers. Try to attend some symphonies or opera if time allows, you will see people selling tickets of various performances everywhere in old town. I have to say there is something about Austria that leaves sweet feelings in your heart, not sure if it’s the people, or Mozart, or landscape, or history, or culture, or music or a combination of everything. 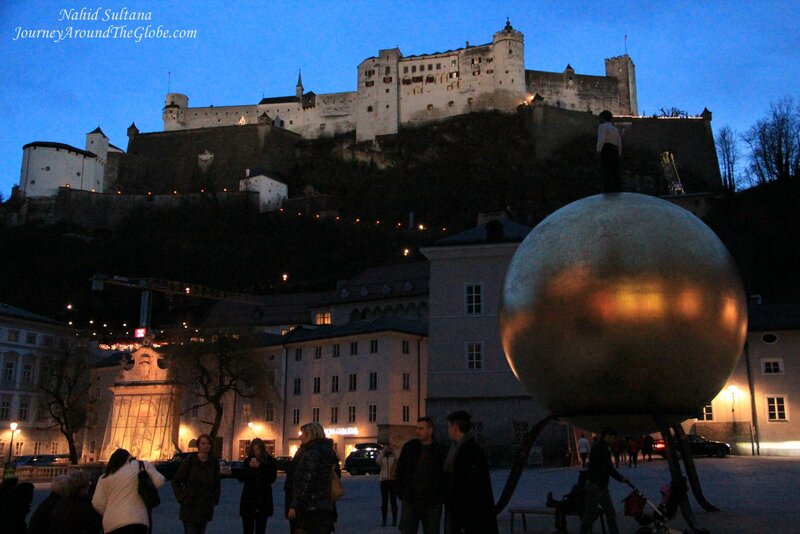 I enjoyed Salzburg more than Vienna, 5 years ago (also recently in December 2013) when we came to Europe. But the charm of both the cities is undeniable. Austria is a German-speaking nation, but locals are very good at English too. This is a huge city and is divided in many districts. We mostly stayed in Innere Stadt, also known as 1st District. 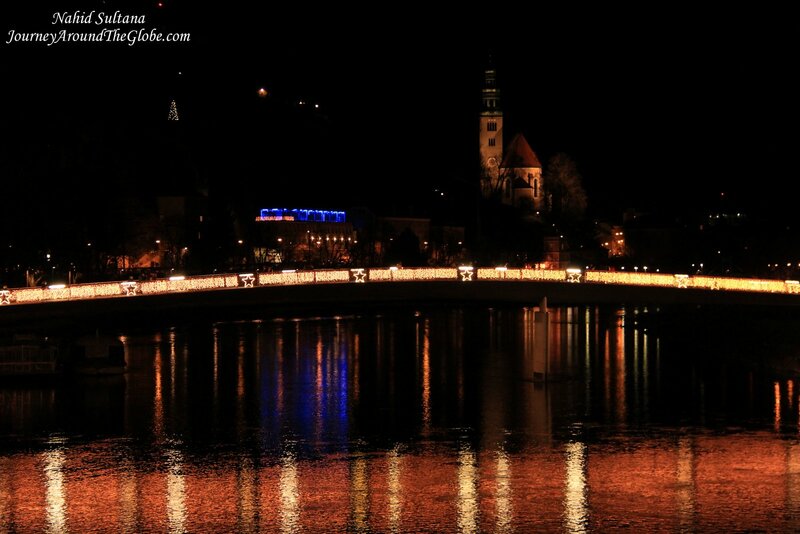 For day trips from Vienna, you can consider crossing the border and going to Bratislava in Slovakia. TIME of TRAVEL: This was the second destination of Easter Break road trip that we took in April of 2012 (yeh, quite a long time ago, this post was overdue). After visiting Nurnberg, Germany, we drove about 5 hours to reach Vienna. It was a great day in Vienna when we arrived. 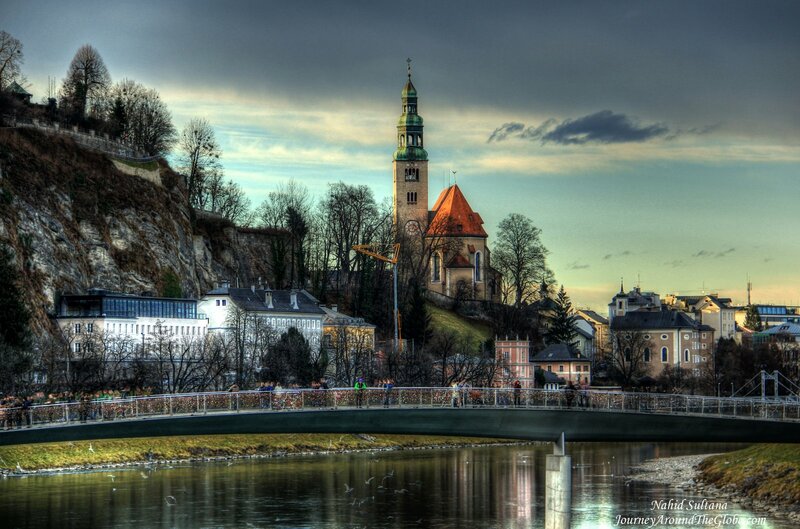 After staying here two days we headed for Bratislava, Slovakia. It was not warm that day, we had to wear light jackets the whole time…but I guess that was expected in April here. 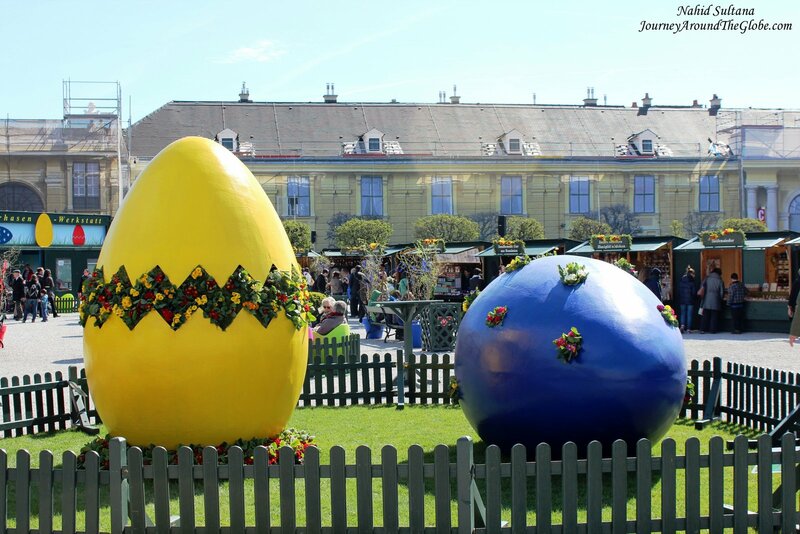 If you are here during Easter break, you will see that Easter in Europe is like Christmas in the U.S.A. It’s gorgeous, very festive, and more colorful than what I saw in America. Vienna was the same too…eggs, eggs everywhere. OUR HOTEL: Our hotel was K&K Palais Hotel in Vienna, very close to the old town and within walking distance from most of the main attractions. It had free breakfast buffet and Wi-Fi. From outside, it looked like the hotel itself was a building from couple centuries back. EATING and SHOPPING: I can’t remember now what we had for dinners in those two nights in Vienna. But for lunch, first day we picked up some pizza from a train station near Austrian Parliament. 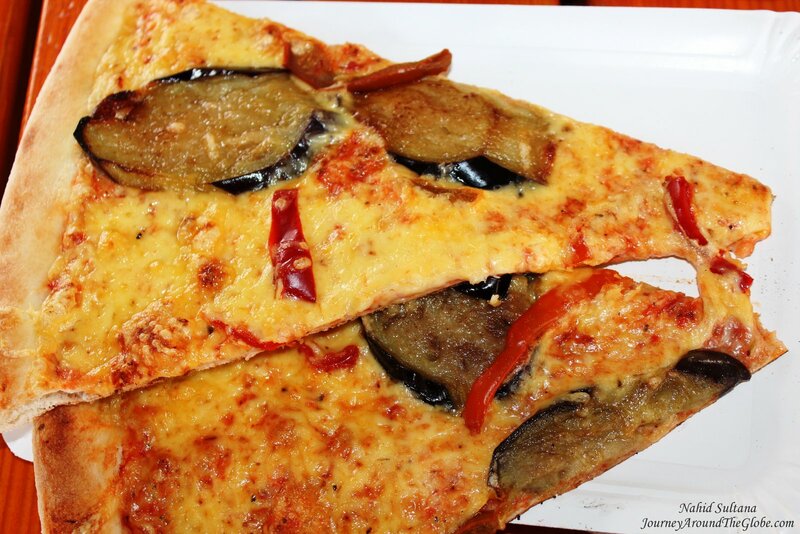 And let me tell you that was one of the best pizza I had in my life…because it had slices of eggplant on it, haha. 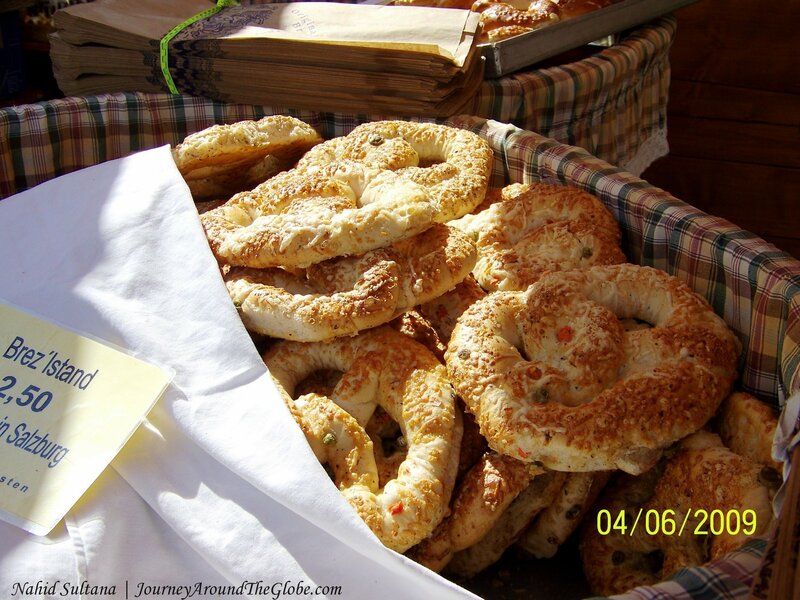 Next day, we had again a quick lunch in the Easter market in front of Schoenbrunn Palace. Something you can try in all over Austria is schnitzel, a fried piece of meat with vegetables and potatoes. 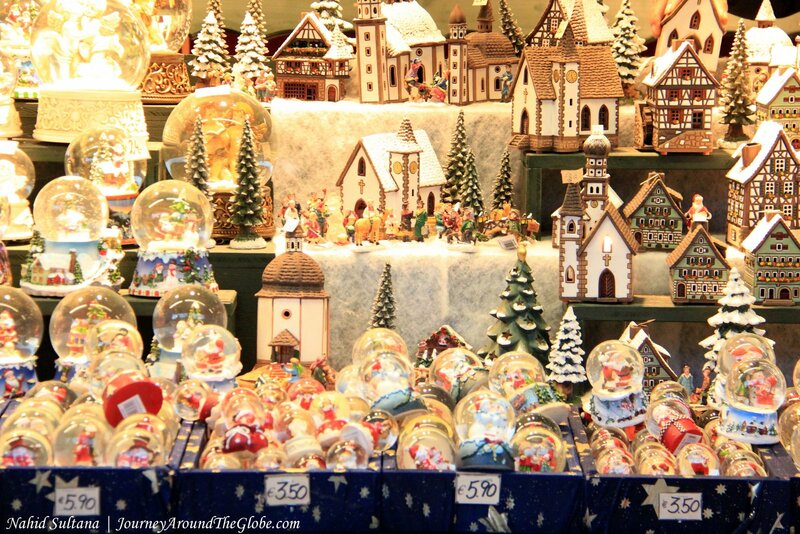 Graben in old town is a very good place to buy souvenirs of Vienna. 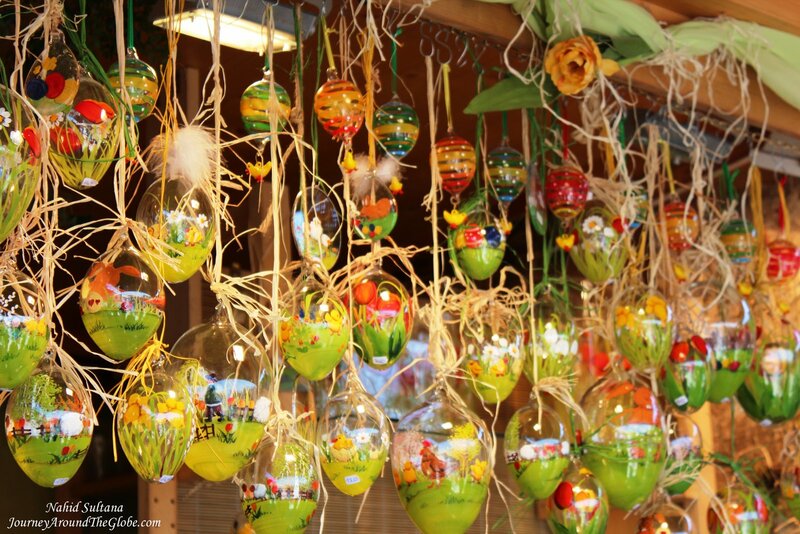 Also we saw a big Easter market in front of Schoenbrunn Palace and it was attractive. Buy Mozart CDs, Mozart chocolates – Mozart Kugel (candy with marzipan), and other Mozart related items from here. 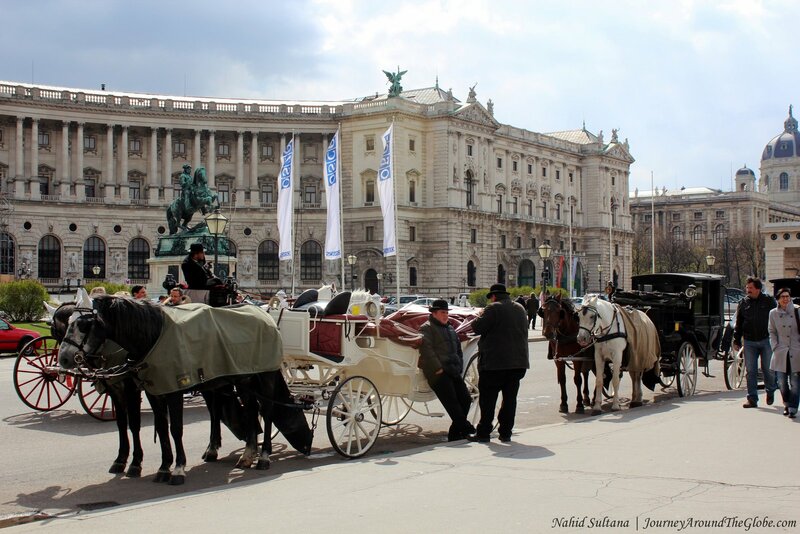 PLACES WE’VE VISITED: We had a day and half in Vienna. 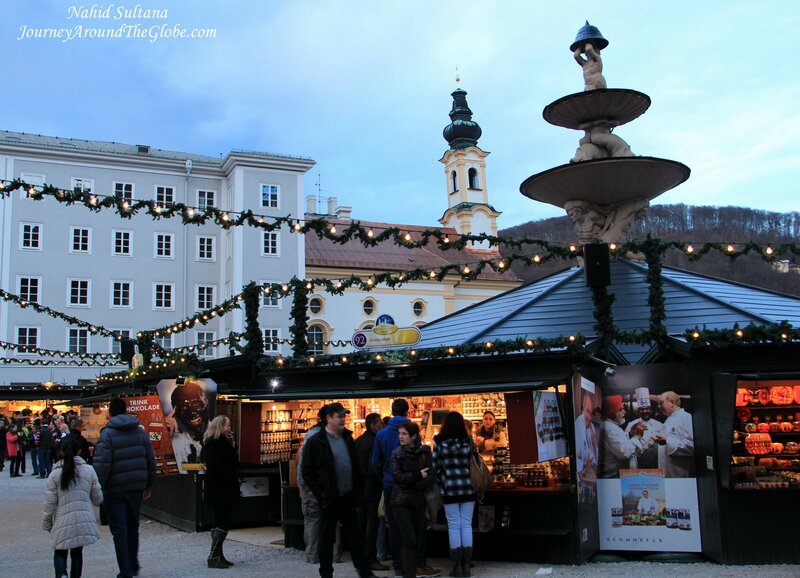 We spent a whole day in the old town on the first day and half a day in Schoenbrunn Palace the following day before we started our drive to Bratislava. Old town of Vienna (Innere Stadt or 1st District) is beautiful beyond my words. This historic part is a UNESCO World Heritage site and like an open-air museum with things to see and enjoy all around. You just have to love its old artistic buildings everywhere. There are tons of museums near and around the city, one I was interested in was Sigmund Freud Museum, which we couldn’t go to. Old town and its surrounding are big but we did it on foot. 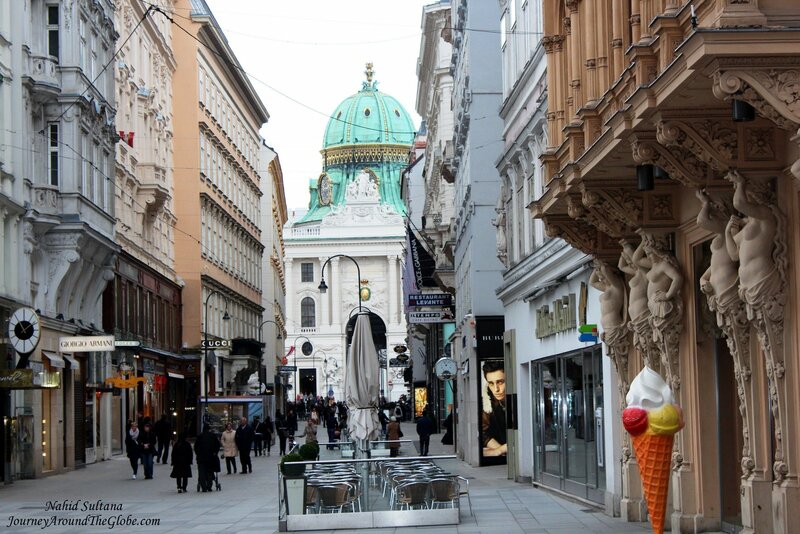 Enjoy the abandoned famous and grand buildings while you are walking on cobblestone streets of Vienna. Here are the thing we could fit in during our visit to Vienna, lucky you if you have more time to spend here. 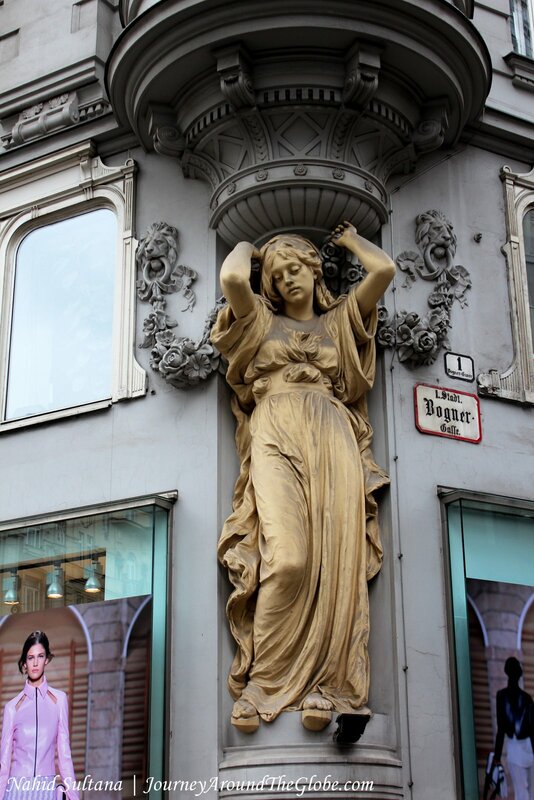 1) GRABEN: Graben is the old district of Vienna where we started our tour from. This is a pedestrian path full of cafes, boutique shops, and beautiful old buildings. This is a perfect place to watch street performers, sit down and watch people go by. 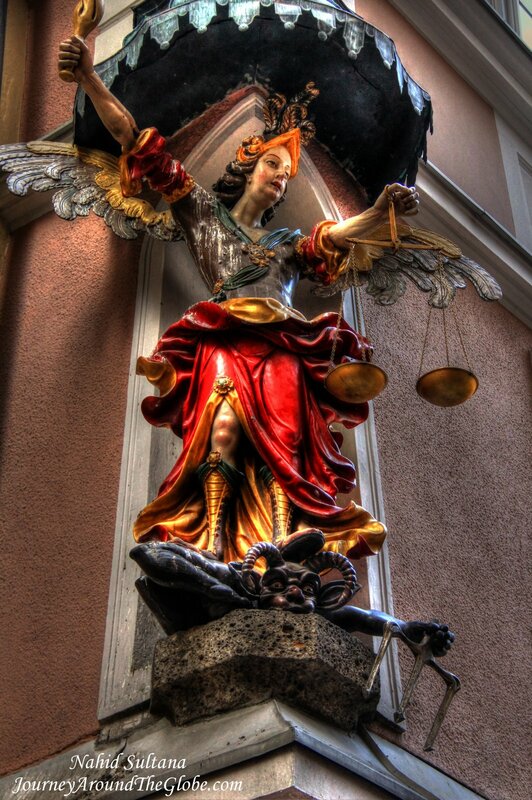 An old statue “Pestsaule” stands in the middle of this cobble-stoned street surrounded by many sidewalk cafes and stores. The statue was constructed to commemorate people who died in plague. You can see St. Peter Church in Peterplatz of Graben. We didn’t go inside but looks like an old church of Vienna…something we should have visited maybe. 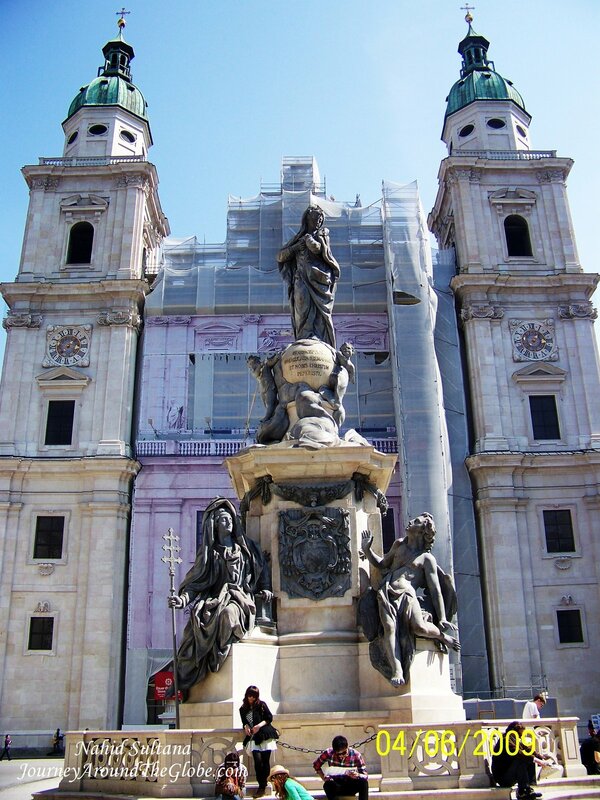 2) MICHAELERPLATZ and ST. MICHAEL CHURCH: About few minutes of walk from Graben, Michaelerplatz is a nice square right in front of the entrance to Hofburg Palace. There was an excavation we saw from the Roman times (at least 2000 years old) in Michaelerplatz. Lots of boutique stores and designer shops are packed in Michaelerplatz. On one side stands beautiful St. Michael Church. 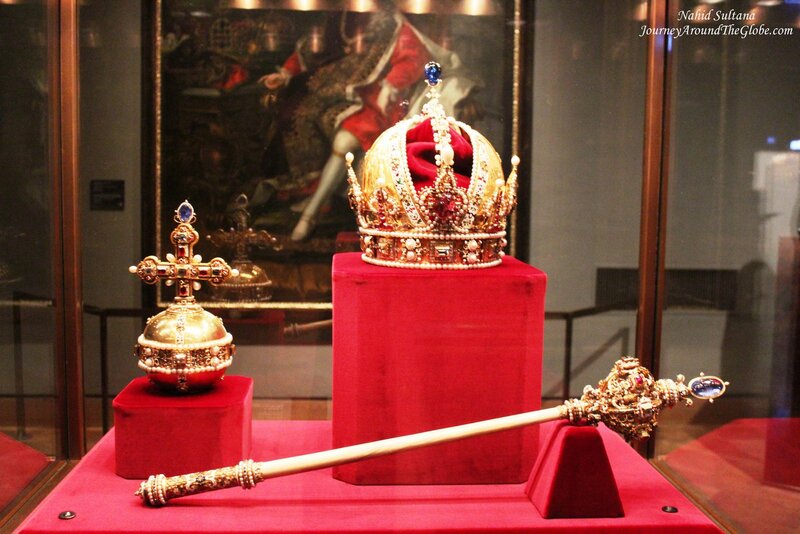 3) HOFBURG IMPERIAL PALACE: This is a must-see attraction of Vienna. Hofburg is the former palace of Austro-Hungarian Habsburg dynasty. 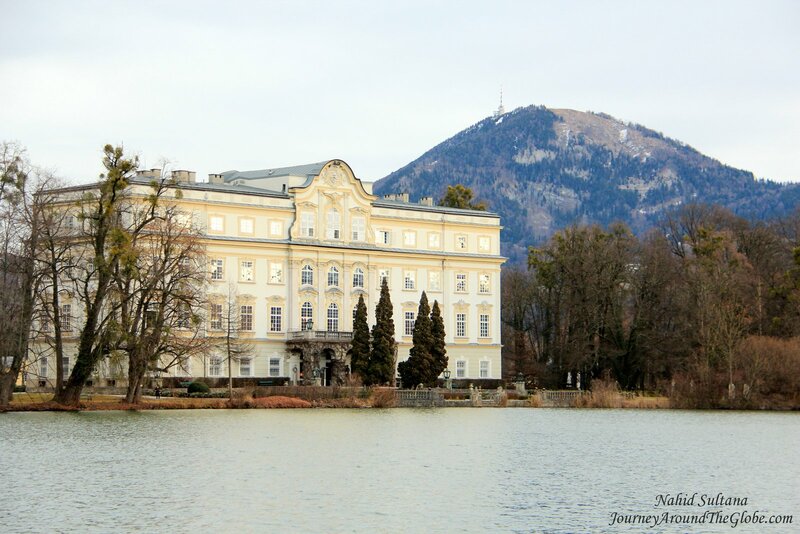 It was their winter residence once but currently serves as the official residence of Austrian President. The palace once housed some of the most powerful people in the history of Austria and whole of Europe. You can visit the imperial apartments of Empress Sisi or Elizabeth and her husband Franz Joseph. A big portion of the palace houses ceramics, porcelain, and potteries that were once used by Austro-Hungarian royal families. It’s a huge collection with room after room displaying Victorian styles of bone china, silverwares, dazzling ceramics, exclusive porcelain arts, dinnerware, centerpieces, glass works, and candle holders ….one is more elegant than the others. One of the grandest rooms displays the way tables were used to be decorated for royal guests…something I’ve never seen before. Hofburg Palace also houses Sisi Museum. Sisi was the daughter-in-law of Austro-Hungarian Empress Maria-Theresa and wife of Franz Joseph. She was a modern and a bit rebellious type of princess who broke some royal rules and was murdered at the age of sixty. Other than the museums inside the palace, inner courtyard of Hofburg is a nice place to take a stroll and go back in time with the old façades of various buildings. Hofburg Palace houses number of interesting museums like weapons and armory collections, coin collections, musical instruments, and lots more. 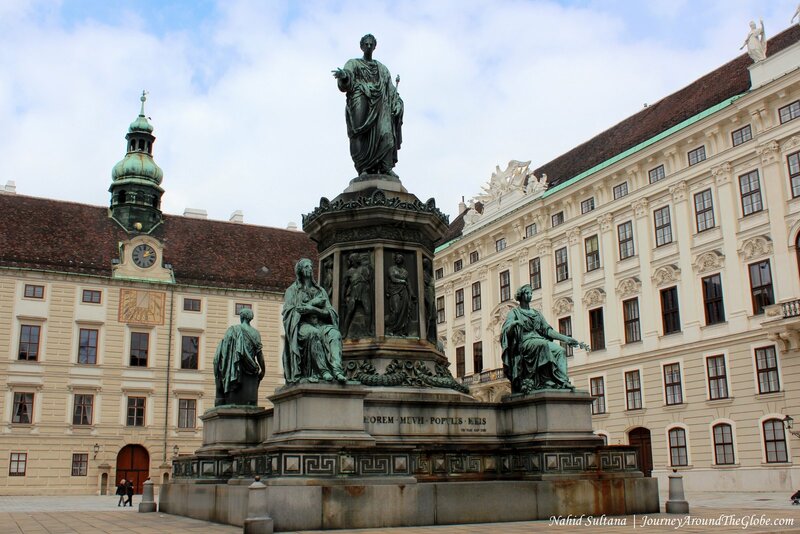 It’s conveniently located in the heart of Vienna and has few gates to enter the palace. Plan to stay here about 2 hours or so. It was 10.50 euros per adult and 6.50 euros for kids 6 – 18 years of age. Audio tour for each visitor is included in the ticket. 4) HELDENPLATZ: This is a beautiful square with some greens in the old part of Vienna. It’s a good place to get a horse-wagon to take you around. The most prominent building here is Austrian National Library with a statue in front. We didn’t go inside but I am sure you can take a tour inside the library and from the outer look of it, I could tell inside must be as grand as its front façade. From Heldenplatz, you can see Austrian National Parliament and the spires of Vienna Town Hall. 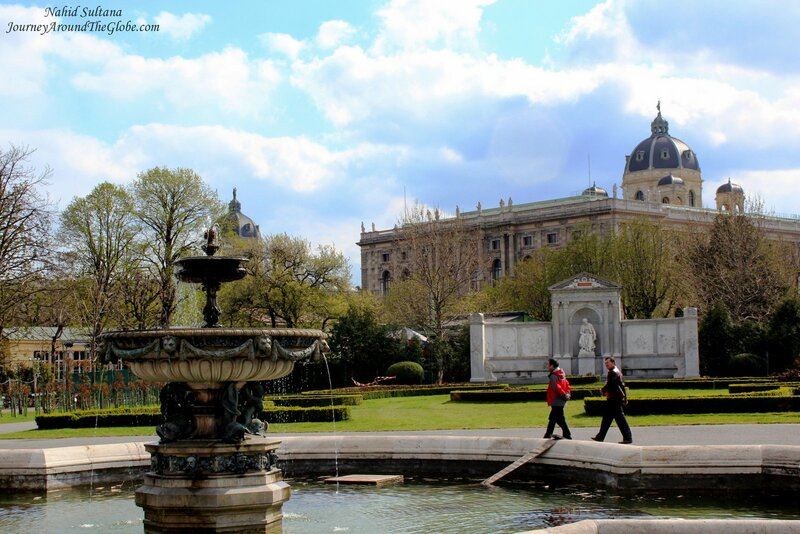 5) MARIA-THERESIEN PLATZ: Few steps away from Heldenplatz is Maria-Theresien Platz. 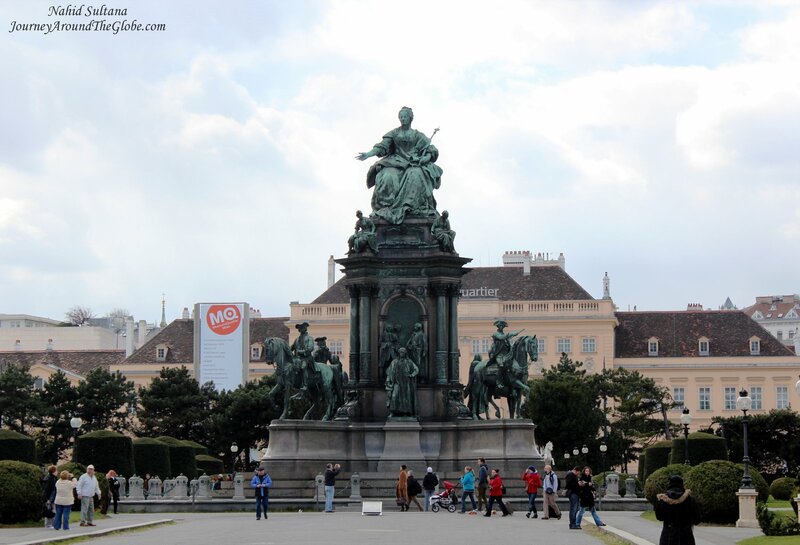 A statue of Maria Theresa, who was a powerful Austro-Hungarian (Hapsburg) queen, dominates this square. The square is like a museum quarter, containing Natural History Museum, Art Museum, and couple other ones. 6) AUSTRIAN NATIONAL PARLIAMENT: After visiting the above square we came out of the old district and ventured into the newer part of Vienna. 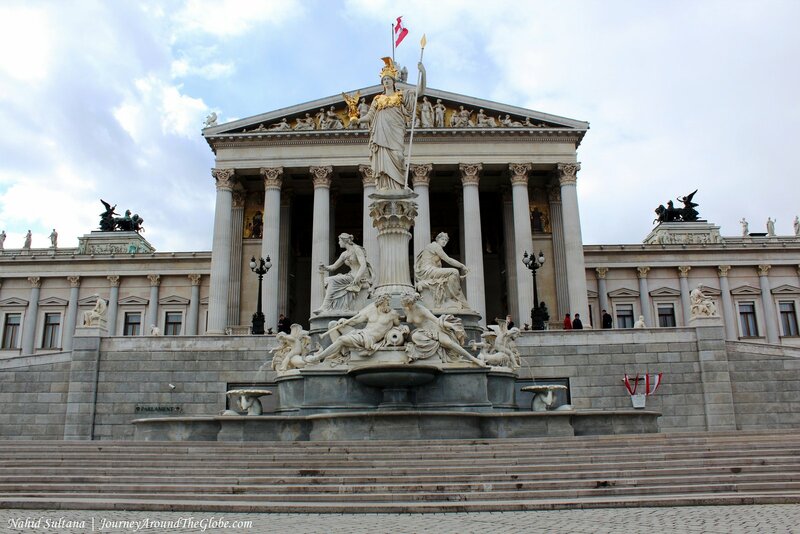 Austrian National Parliament is a handsome building with many statues in the front. It’s situated on a very busy area which is on the other side of Heldenplatz (about 5 minutes of walk). If I can remember correctly, the parliament was closed in weekends but tourists are welcome to take guided tours inside at regular business days or when not in session. 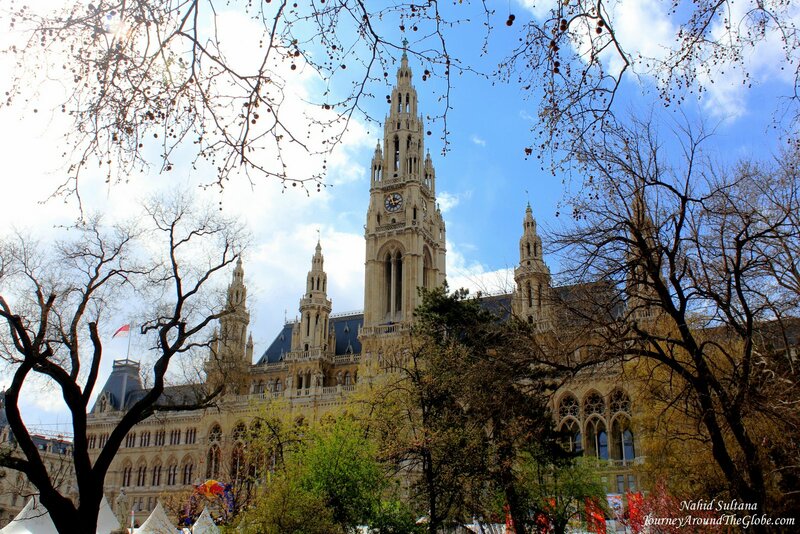 7) VIENNA CITY HALL (RATHAUS) and BURG THEATER: Vienna City Hall is very close to the parliament. It’s a stunning Gothic-style edifice with few spires reaching up to the sky. There is a big park in front and surrounding the city hall. And when we went, some kind of sporting event was going on here with some vendors selling sporting gears and goods, bicycling stunts, and etc. 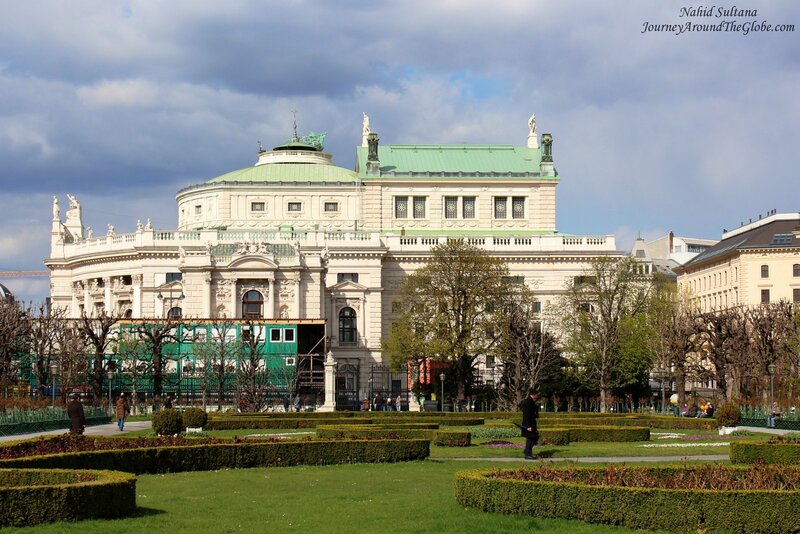 Across the park of city hall, on the other side of the street, is Vienna’s beautiful Burg Theater. This is another well-known landmark of the city. 8) VOLKS GARDEN: Volks Garden is a beautiful greenery space in the heart of Vienna. Opposite of the parliament and town hall, and beside Burg Theater, Volks Garden is a place that connects old district to the new part. It was nice to walk around this garden and enjoy some beautiful sculptures, fountains, and trees. 9) TREASURY MUSEUM: Next we came back to old town again and stopped at Treasury Museum. 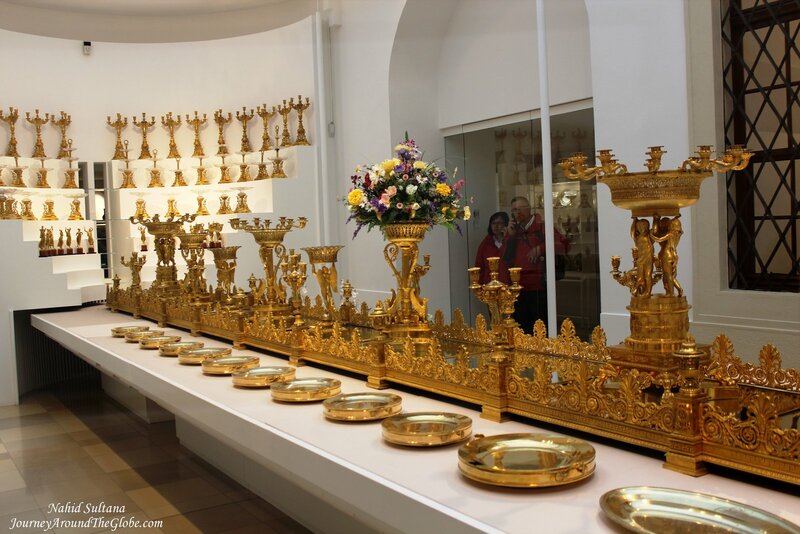 This is a royal treasury chamber where you can see some expensive imperial valuables including Hapsburg crown, scepter, sword, hand embroidered royal robes and capes, jewelries, religious items, and gold-plated serving dishes. May be the most significant of all is the gold royal crown decorated with many different precious stones and jewels. It was 12 euros per adult and free for children under 18 years. Museum is open every day from 9am – 5:30pm except Tuesdays and last admission is at 5pm. It took us about an hour. 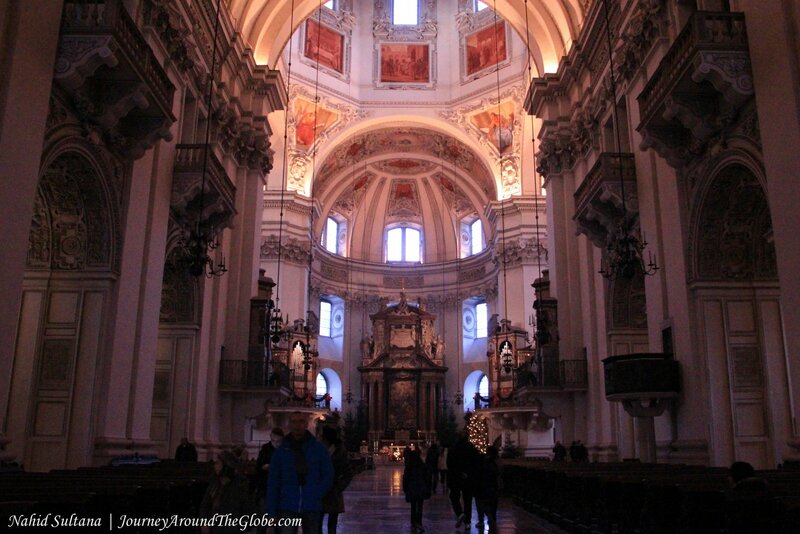 10) ST. STEPHEN’S DOME or STEPHANSDOM: This was our last stop of day 1 in Vienna. 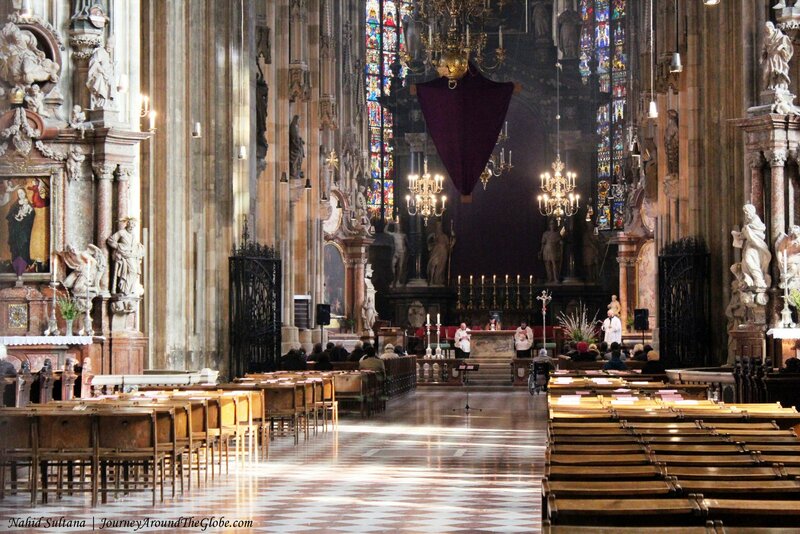 This is the most beautiful church in Vienna and one of the tallest churches in the world. The dome is also located in old town, a bit further away from Hofburg Palace. The square in front of the church, Stephansplatz, is big and energetic place to hang out. It was very crowded but loved its lively atmosphere. 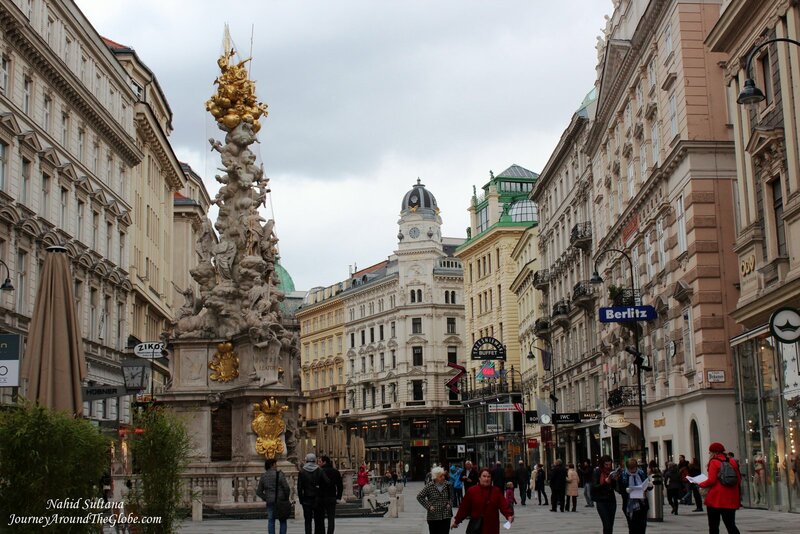 Stephansplatz is packed with lots of shops, cafes, restaurants, and old historic buildings. 11) SCHOENBRUNN PALACE: This is one of the major touristic attractions of Vienna and you shouldn’t leave the city without visiting this place. The palace kind of reminded me of Versailles Palace in France. It is one of the most important cultural monuments in Austria and is a part of UNESCO World Heritage site. 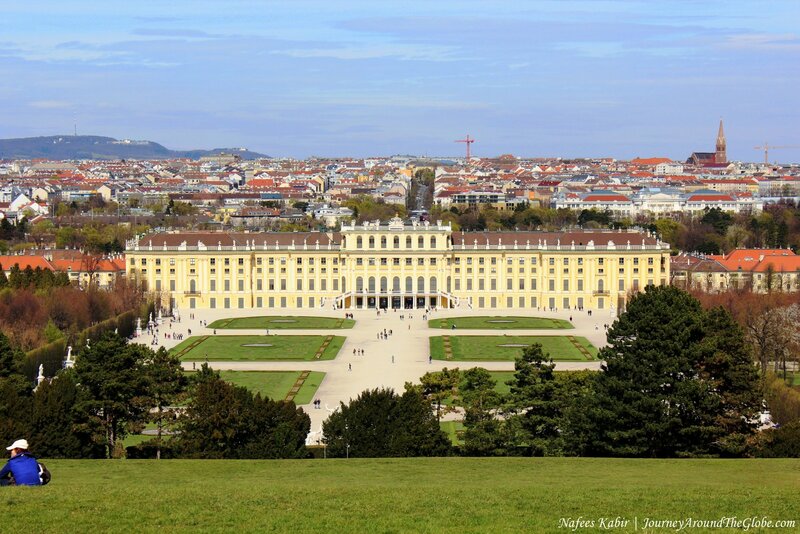 The palace was a gift from Emperor Francis I to Austro-Hungarian queen Maria Theresa on their wedding. 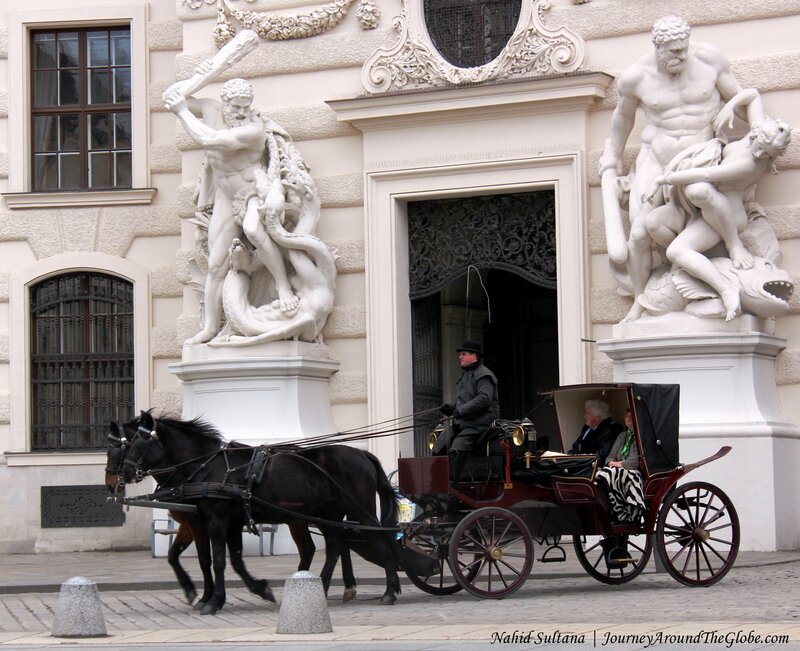 It was their preferred summer residence while Hofburg Palace served as their winter residence. There are tons of things to do in Schoenbrunn Palace. You can spend a whole day here and will leave with more things to check out. After visiting inside the palace rooms (photos weren’t allowed) we came out to the garden. I am sure the garden looks better in summer, but even in April, it was nice walking on the ground towards the panoramic terrace. Privy Garden or Romantic Arbor is decorated with many sculptures and an impressive fountain on the other side. If you keep going up passing the fountain, you will see Gloriette or Panorama Terrace. The terrace is a bit elevated and view from there is stunning. You can see almost the whole of Vienna and the palace complex. There is an artificial lake in between the terrace and garden. Another section of Privy Garden includes a big part for the kids. We spent some time in the park, maze, and water fountain playgrounds with our girls. Finally, a palace which was kids-friendly! There is also a children’s museum inside the palace complex. Family ticket to the children museum is 20 euros for 2 adults and 3 kids. 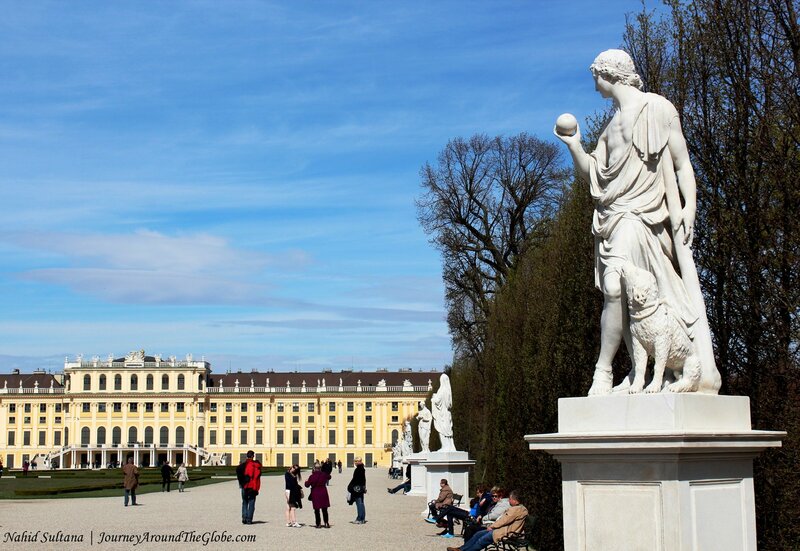 It took us about half an hour from the old town Vienna to reach Schoenbrunn Palace. We had our own car but there are buses that leave daily from Innere Stadt. For private cars, a big parking ground is available very close to the palace. The palace offers different types of tours. “Classic Plus” covers everything except the zoo and takes about 4 hours. A self-guided audio tour is included in the price. With this tour you get to see the apartments which depicts life-style of the royals, garden, and its big complex. 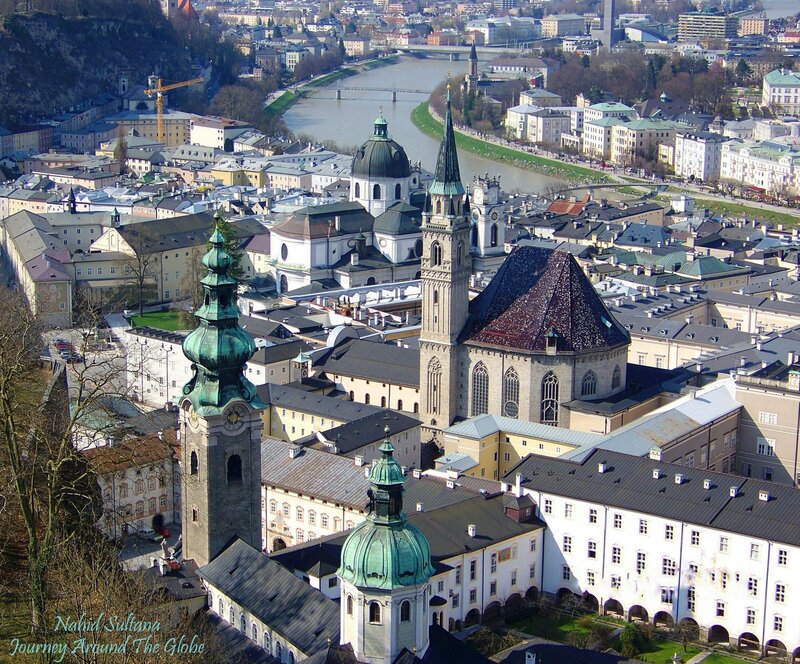 “SOUND of MUSIC” TOUR in SALZBURG, AUSTRIA: Salzburg become really famous with English-speaking people or at least those who are into English movies by the musical film “Sound of Music”. It was Julie Andrews’ one of the most famous works in her acting career. She played the role of “Maria”, a nun who was appointed to take care of seven children of an Austrian imperial navy captain. Based on a true story of a family with seven children and their father Captain Von Trapp, Christopher Plummer played the role of the captain. The setting of the story was from 1939 during the onset of WWII and the movie was shot in 1965. I got acquitted with this film when I was very little and my mom used to sing “Do Re Mi Fa…” with much enthusiasm. She even tried to teach us that song (my mom was a professional radio singer and a music teacher) in her harmonium. I have some fond memories with this film and vividly remember my mom singing those melodious songs around the house and doing her chores. 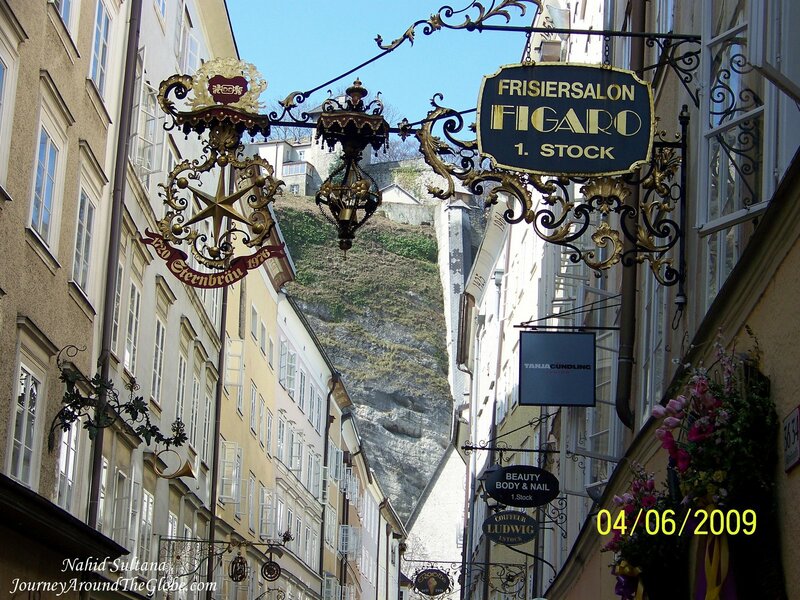 In our first trip to Salzburg in April of 2009, we spend all our time in the city looking around its old part and the fortress (Hohensalzburg Festung) on the hill. But this time (during Christmas break in December 2013) we decided to go on with this tour to get out of the city. Also because both of our daughters watched “Sound of Music” so many times that they memorized all the songs and most of the dialogues from it. We booked the tour with “Panorama Tours”. They are the most popular here for this trip. You can book thru you hotel or reserve your seat online ahead of time, like us. They operate even on holidays like Christmas day! Bus leaves every day at 9:30am and 2pm and lasts for 4 hours. It is 40 euros per adult and 20 euros for children 4 – 12. We were picked up from our hotel around 9:15am and taken to their main office near Mirabell Palace. Bus was about half full because it was Christmas day. The guide was fantastic and so was the driver. 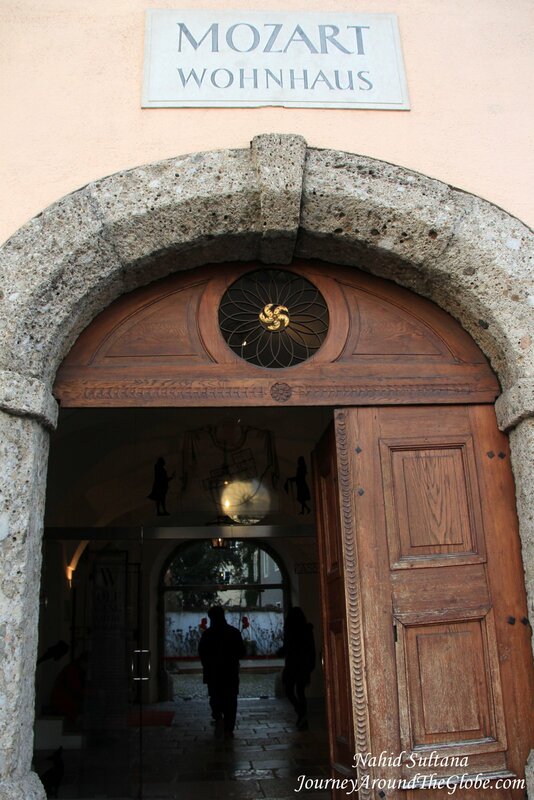 We were first taken to Leopoldskron Palace, just few kms away from Salzburg old town. This palace was used to only shot the “backyard” scenes of the movie. And the lake you see in the picture is where Maria (Julie Andrews) and the kids fell off the boat in one scene. 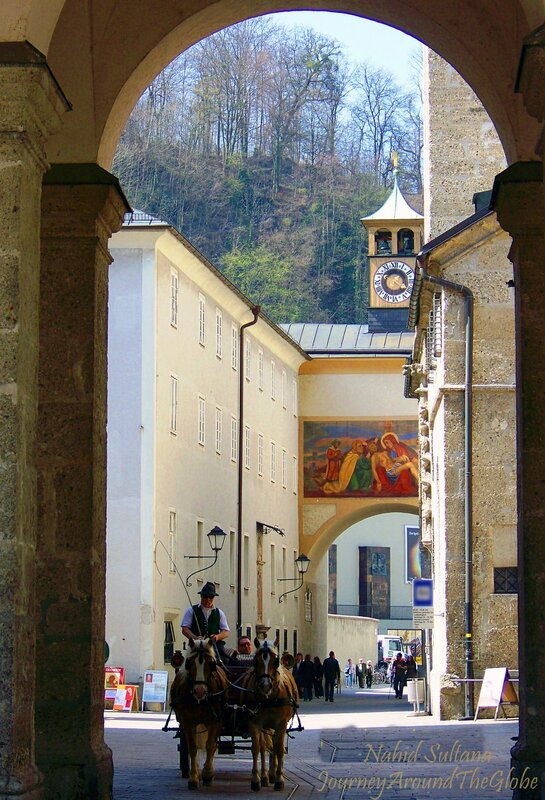 It is a very scenic spot of Salzburg. We couldn’t go inside or even near the palace since it is not open to public, only saw it from the other side of the lake. Next stop was Hellbrunn Palace garden. This is a bit away from the city. Before entering the palace there is an unpaved and tree-shaded road. This long path was used to shoot a small portion of “I have confidence” song when Maria left her abbey, got of the bus and went to captain’s house for the first time. 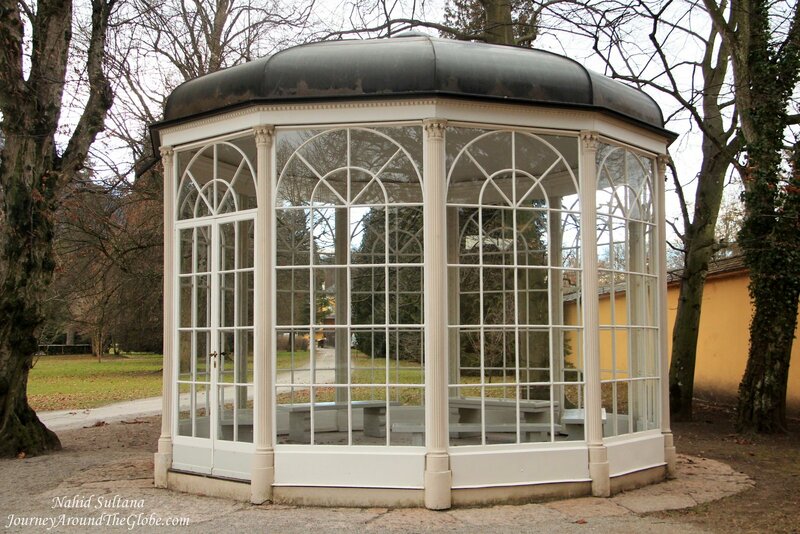 The purpose of coming to Hellbrunn Palace was to visit the famous gazebo of “Sound of Music”. It was shown in the songs “I am 16, going on 17” (with Lisle and Rolf) and “Something good” (with Christopher Plummer and Julie Andrews). The gazebo was originally located in Leopoldskron Palace garden during the movie but later it was moved here. From Hellbrunn Palace, we drove by the mountains which you may have seen in the last scene of the movie when the family escape to Switzerland. 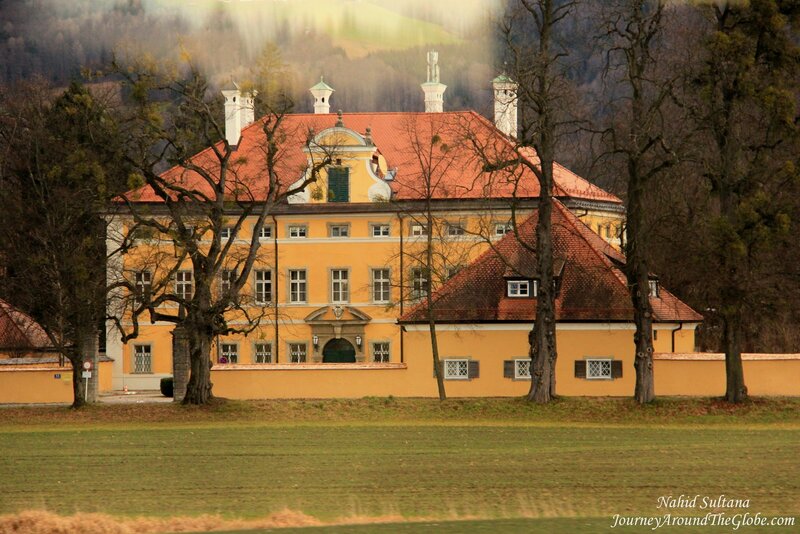 Another spot we just drove by and didn’t make a stop was Frohnburg Palace. This yellow mansion was used only to show front façade of captain’s home. All the scenes inside the house were done in Hollywood. Third place we drove by without stopping was Nonnberg Abbey in Salzburg, within walking distance from Hohensalzburg Fortress. This abbey is from 740 A.D. and is still active. This is where the real Maria served as a nun. The movie also used the same spot to shoot Julie Andrews’ life as a nun. The abbey is not accessible to public. From here, we took a long drive through the mountains and lake-district of Salzburg. This was a very scenic drive with breathtaking views of Alps, meadows, trees, and lakes. After passing Fushel Lake, we made a quick stop at Wolfgang Lake in St. Gilgen. This whole region was shown as an aerial view at the very beginning of the movie and the mountains here were used to shoot the infamous “Do Re Mi Fa” song of this movie. Lots of people come here during summer for many water activities, to just relax by the lake, and to enjoy Alpine beauty. 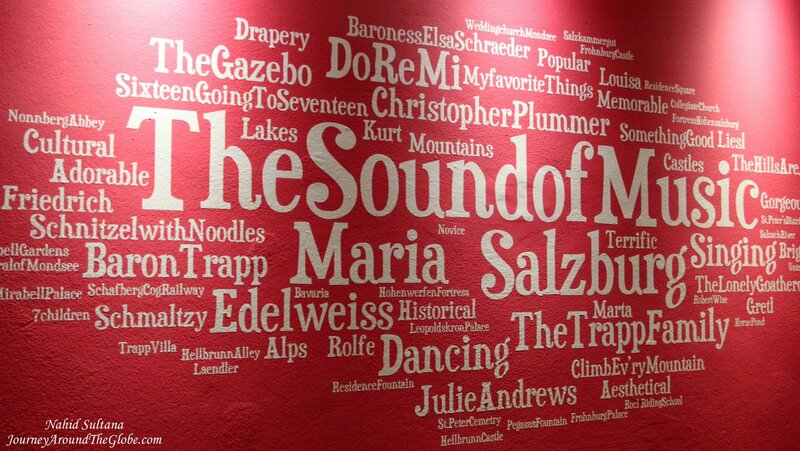 By the way St. Gilgen is also the birthplace of famous composer Mozart’s mother. Our last destination of the tour was the “Wedding Church” in Mondsee. This is the place where Captain Von Trapp and Maria get married in the movie (not in real life). 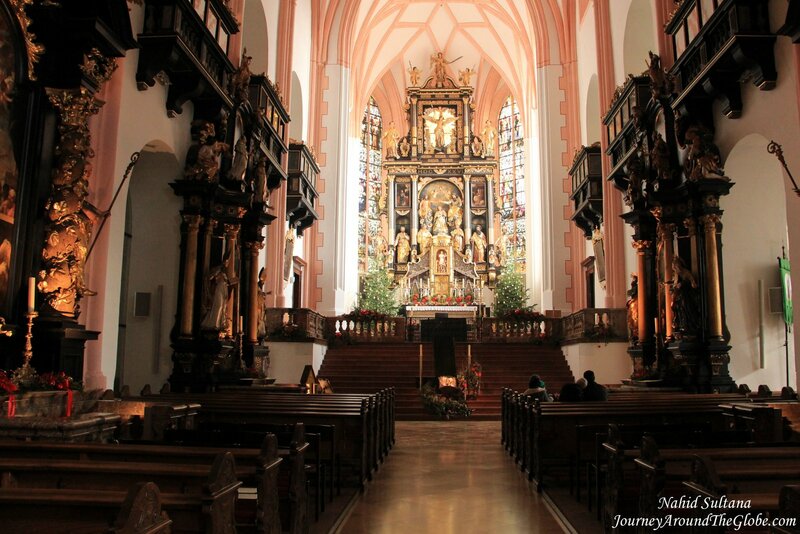 It was a former Benedictine monastery which is now called Parish Church St. Michael or Mondsee Basilica. The original monastery was founded in 748 A.D. Inside the church is extremely gorgeous and elegant, no wonder they chose this spot for their special wedding scenes. This church was selected over the actual abbey (Nonnberg Abbey) for the wedding scene due to its elegance and beauty. Even though in the movie it was portrayed that Maria and Captain got married in Nonnberg abbey! 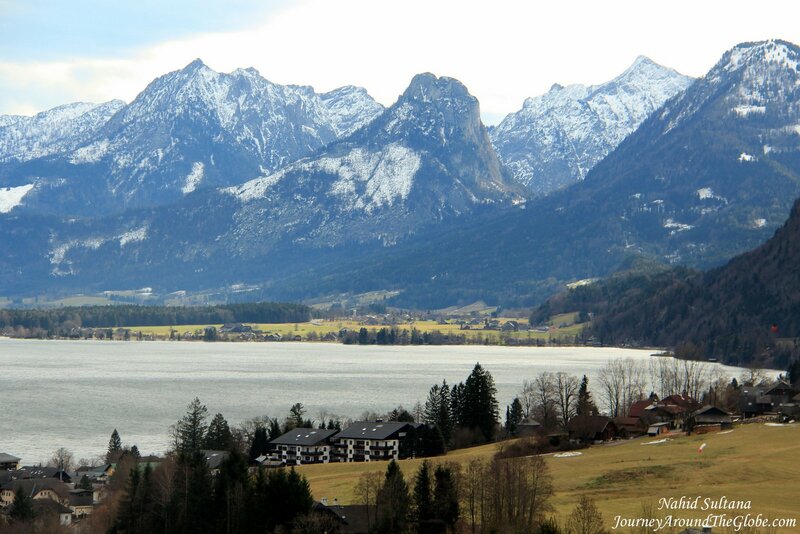 The small village of Mondsee is situated by stunning Mondsee Lake surrounded by the Alps. The city center where the church is located is absolutely beautiful. We didn’t have time to go by the lake, but I am assuming it must have a breathtaking view. 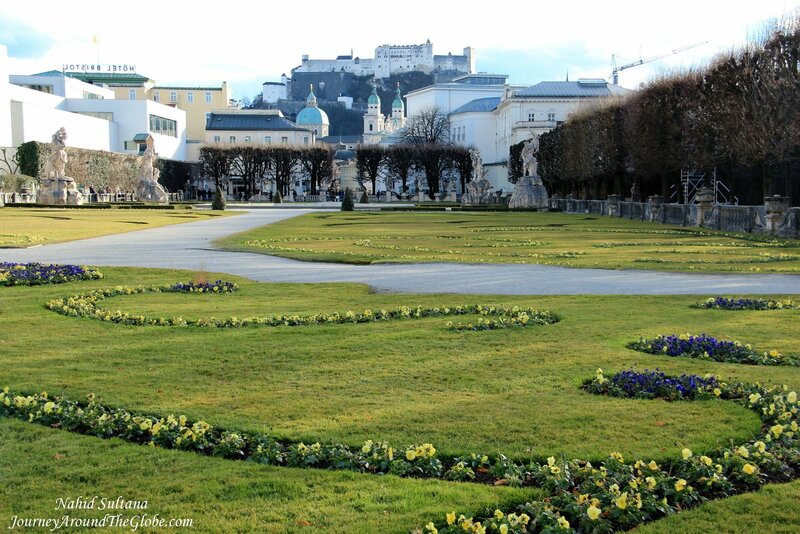 We were dropped off near Mirabell Palace and Garden in Salzburg at the end of the tour. Few scenes were also done in this beautiful garden. 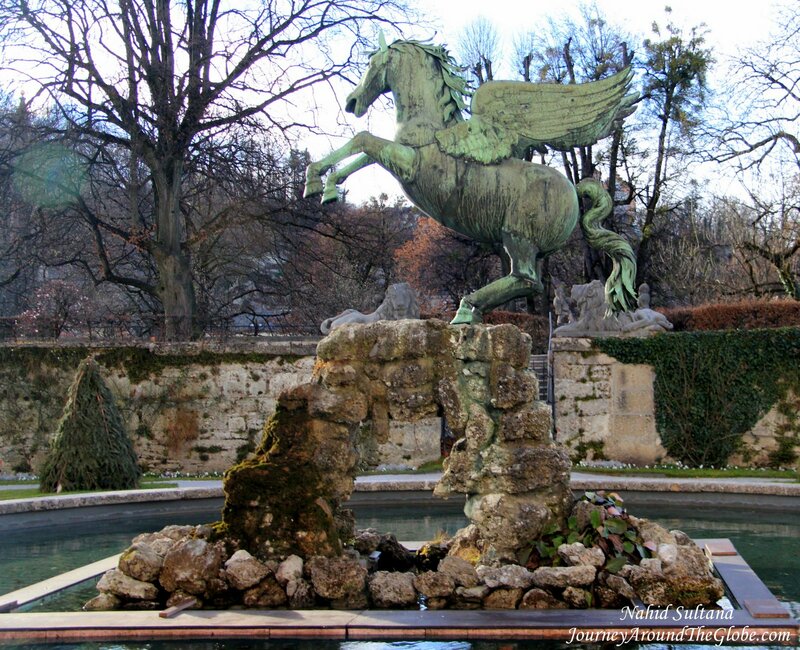 But the most remarkable statue was seen in some scenes was the statue of a Pegasus. It was moved around the city few times, I think, before it could find its final home in Mirabell Garden. 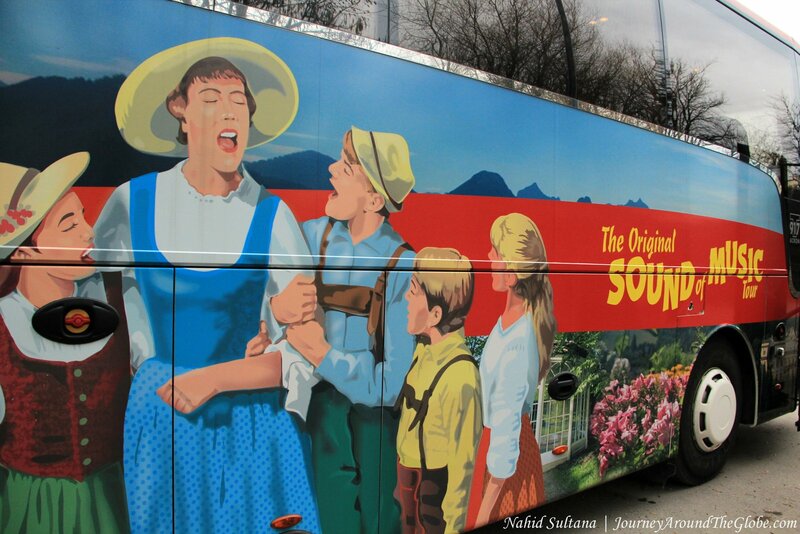 Overall, this trip is a must for the fans of “Sound of Music”. Not only you get to see some spots of the movie right in front of your eyes but also you get to experience some Austrian Alps and its lake-district. It was a wonderful experience…probably the best part of this trip was when a lady on the other aisle started singing some songs from the movie with the CD our driver was playing on our way back to the town…I felt like I am in the movie singing too. By the way, my favorite song is definitely, “Edelweiss…Edelweiss, every morning you greet me, small and white, clean and bright, you look happy to meet me.” What is your favorite song from “Sound of Music”?